A Navy supervisor watched as crews hauled a piece of the Confederate warship Georgia from the bottom of the Savannah River. The vessel was scuttled to prevent Union troops from capturing the massive gunship. SAVANNAH, Ga. — After 150 years at the bottom of the Savannah River, the armored skeleton of the Confederate warship Georgia is being raised to the surface one 5-ton chunk at a time. 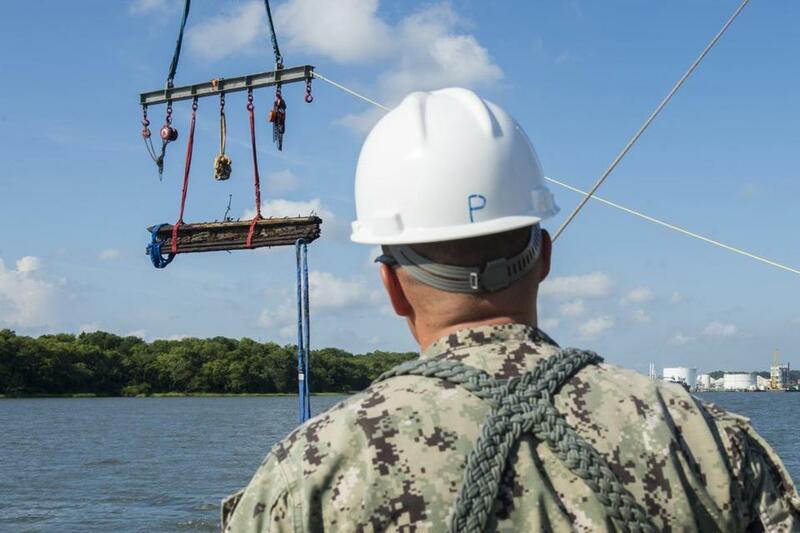 Navy divers who began working in late June to recover cannons, unexploded shells, and other artifacts from the riverbed finally started midweek on their last major task: retrieving an estimated 250,000 pounds of the Civil War ironclad’s armored siding. The CSS Georgia was scuttled by its crew to prevent General William T. Sherman from capturing the massive gunship when his Union troops took Savannah in December 1864. The remains of the Confederate ironclad are being salvaged as part of a $703 million deepening of the Savannah River for cargo ships. ‘‘The historical significance is evident in everything we do,’’ Chief Warrant Officer 3 Jason Potts, the Navy’s on-scene commander, said Wednesday as his crew prepared to start raising the first of three slabs of armor. The Georgia was a crude example of the first armored warships designed during the Civil War to stand up to cannon and artillery fire. Its 1,200-ton frame was built using three layers of timber topped with 24-foot strips of railroad iron. Having sections of the Georgia’s armor for study should reveal more about how the Confederacy compensated for the lack of an industrial base when it came to building ships. The Georgia proved so bulky its own engines were too weak to propel it against the Savannah River’s currents. The Confederates anchored the ironclad off Old Fort Jackson as a floating gun battery. It was sunk without ever firing a shot in combat.